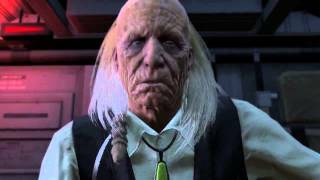 Seek vengeance with Snake in Metal Gear Solid V: The Phantom Pain on Xbox One, PlayStation 4, Xbox 360 and PlayStation 3. 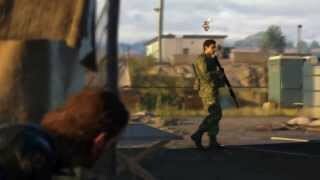 With an Open-World game design, MGSV: The Phantom Pain gives players ultimate freedom on how to approach missions and general game progression. Control the clock using Snake's E-cigarette to tackle missions at a time of your choice, and witness real-time weather that further immerses you in the world of Metal Gear Solid. 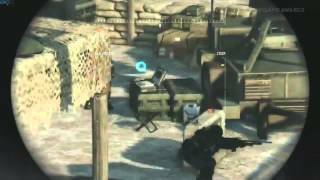 Stalk and stealthily slaughter enemies from the shadows, or man two-legged killing machines and engage in explosive warfare in the new Multiplayer mode, Metal Gear Online. 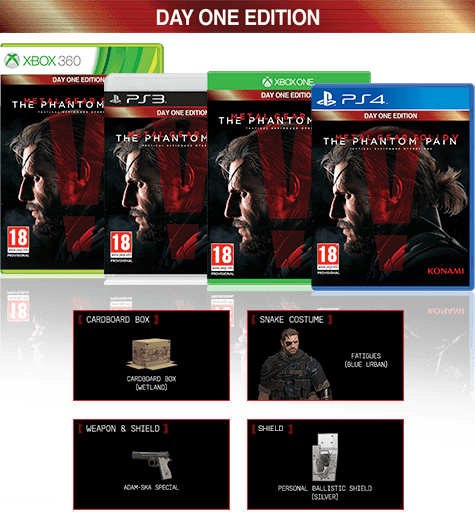 Combining photorealistic graphics and thoughtful game design using Fox Engine technology, MGSV: The Phantom Pain creeps up on next-generation consoles in style. Enter into the new world of Metal Gear Solid V: The Phantom Pain Collector's Edition, available only at GAME! 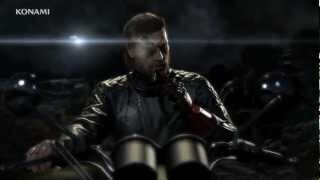 Dive into Snake's latest adventure as he fights for revenge against those who have wronged him. 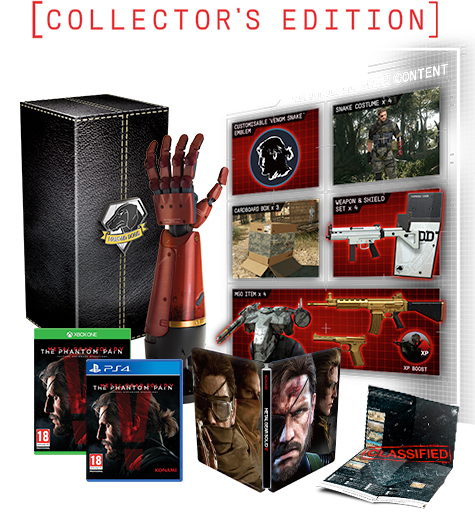 Complete with a range of in-game and physical items, the Collector's Edition is a must for any die-hard Metal Gear Solid fan. Prepare yourself for the open-world experience of Metal Gear Solid V: The Phantom Pain with the Day One Edition. Snake's back in style and is ready to take down anyone who is foolish enough to stand in his way. 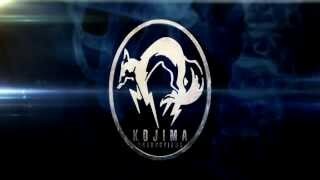 Experience a brand new Metal Gear Solid adventure where you have the ultimate freedom. With a range of in-game items, the Day One Edition of the game will give you more options on how to approach each mission! 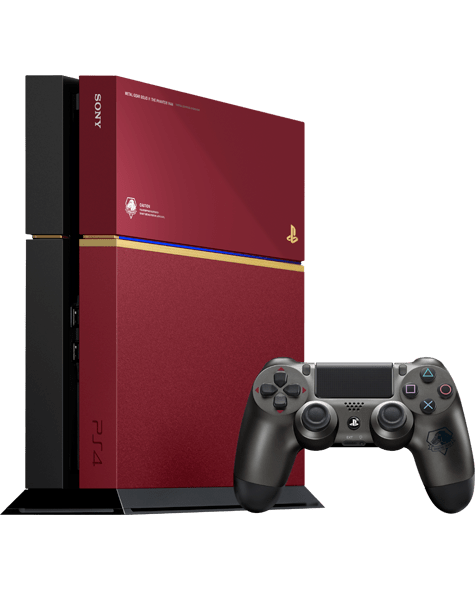 Inspired by Snake's bionic arm, this red and gold PlayStation 4 500GB limited edition console is the ultimate collector's piece for any Metal Gear Solid fan! Even the Dualshock 4 is dressed to kill in a gun-metal grey colour scheme, to match Snake's in game handgun! The PS4 and Dualshock 4's striking new look is completed with the unit emblem of the Diamond Dogs! Purchase additional Mother Base Coins to gain access to more in-game Forward Operating Bases. Each additional F.O.B. will help strengthen your army & build resources quicker, enabling you to develop better equipment and get access to bigger and better technology throughout the game. Get your head in the game with the PlayStation 4 Headset, available only at GAME! This high quality stereo headset will immerse you in the Metal Gear Solid universe. 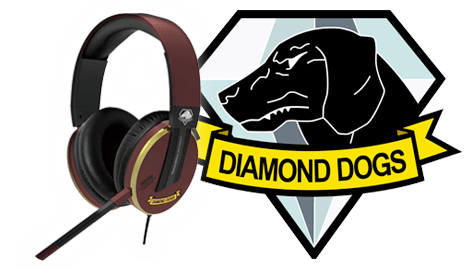 Complete with a unique colour scheme, matching the limited edition Metal Gear Solid V PlayStation 4 console, this headset is perfect accomplice for any gamer as they make their way into The Phantom Pain! Know everything there is to know about Metal Gear Solid V: The Phantom Pain with the Strategy Guide! Arm yourself with intelligence and take on every foe, sure in the knowledge that you will have the upper hand. 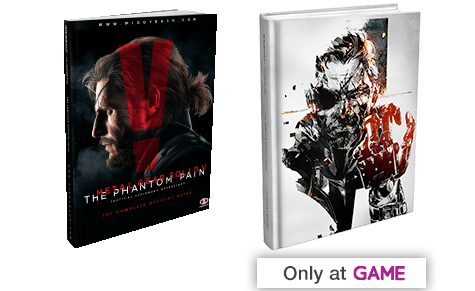 From mission walkthroughs to tips on how to best every opponent, the Strategy Guide is your ultimate secret weapon to 100% completing Metal Gear Solid V: The Phantom Pain. Sink into the shadows as you join ranks with Snake with our range of Metal Gear Solid V T-Shirts! Stand out from the crowd and show your love for the Metal Gear Solid franchise as you don one of our range of T-shirts. 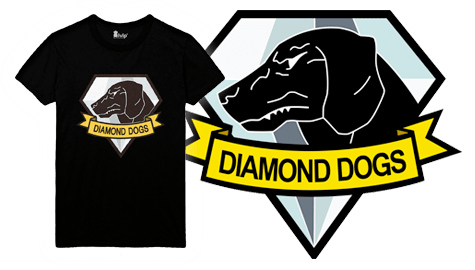 Perfect for all dedicated Diamond Dogs! See our full range of Metal Gear Merchandise, we have everything for the true Big Boss fan! Including Posters, Mugs, T-Shirts and Posters, all true Diamond Dogs are sure to find something.